Baby Carrier Mini is a small baby carrier that’s easy to use for frequent short babywearing sessions. It’s perfect for the first months when, like all newborns, your baby needs lots of closeness around the clock. You can easily unfasten the entire front section of the baby carrier to lift out your sleeping baby. The soft fabrics gently hug your baby’s back, legs and hips, and provide good support. Through the fabric, you can check your newborn’s position and the natural C curve of their back with your hands. Baby Carrier Mini is a small and easy-to-use baby carrier that best suits newborn babies, with their great need for closeness. You carry your baby high up on your chest, so that they always feel your heartbeat. Baby Carrier Mini is very easy to use, with just a few adjustable buckles. 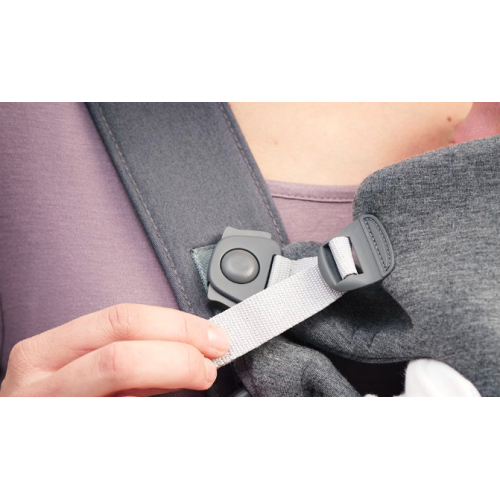 This means that you can quickly put it on, day or night, to comfort or lull your newborn to sleep. You can easily unfasten the entire front section of the baby carrier to lift out your sleeping newborn. The size and head support are fully adjustable, which means the baby carrier is easy to adapt as your newborn grows. The supersoft fabrics of Baby Carrier Mini make it cosy for your newborn and comfy against their delicate skin. The baby carrier gently hugs your newborn’s back, legs and hips, and provides good support so that they sit in a comfy, ergonomic position. Through the fabric, you can feel your newborn’s position and the natural C curve of their back with your hands. The fabrics we use have been developed specifically for our baby carriers and are designed to suit newborn babies. Our mesh and jersey baby carriers are made of 3D fabrics that consist of three layers – an inner layer, an outer layer and a middle layer. Instead of padding that might make the baby carrier too warm, the middle layer consists of a fine, single-fibre thread. This gives the baby carrier the stability of padding, yet ensures a very good air flow, so that it stays airy and cool when you’re babywearing. BCI-certified cotton that’s slightly stretchy in the seat area, and satin woven to make it supersoft and comfy. A thin middle layer ensures a small, compact and flexible baby carrier. Baby Carrier Mini is small and this makes it easy to pop in the changing bag or under the pram when you’re not using it. Good head support is very important for a newborn baby and during the first five months until they can hold up their head unaided. 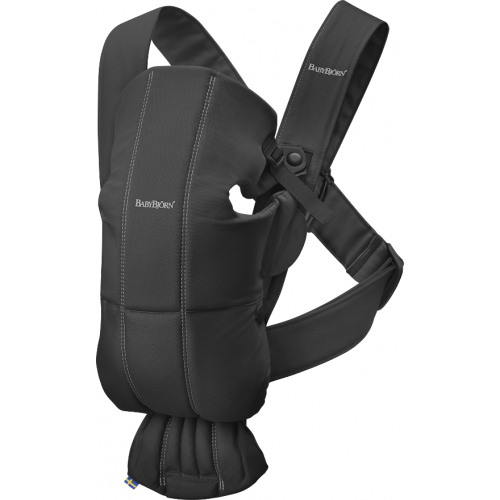 Baby Carrier Mini has sturdy, adjustable head and neck support. When you carry your newborn in a baby carrier, you keep your hands free for other things. Perfect when your newborn baby needs a lot of closeness. Once your baby has grown a little larger, you can choose whether to carry them in the facing-in or facing-out position. When you carry your baby in the facing-out position, they should be at least 5 months old. Carrying comfort becomes increasingly important for you as your baby grows. Do you want to be able to carry your growing baby for longer sessions or on your back? Check out Baby Carrier One – our best-selling ergonomic baby carrier with a waist belt and padded shoulder straps, more functions and back carrying for children up to 3 years. Most suitable during your baby’s first months. Tested and safe for 0–1 years (min. 3.2 kg, max. 11 kg). When you carry your baby in the facing-out position, they should be at least 5 months old and weigh no more than 11 kg. The leg straps should be used to reduce the size of the leg openings for babies who weigh between 3.2 and 4.5 kg.